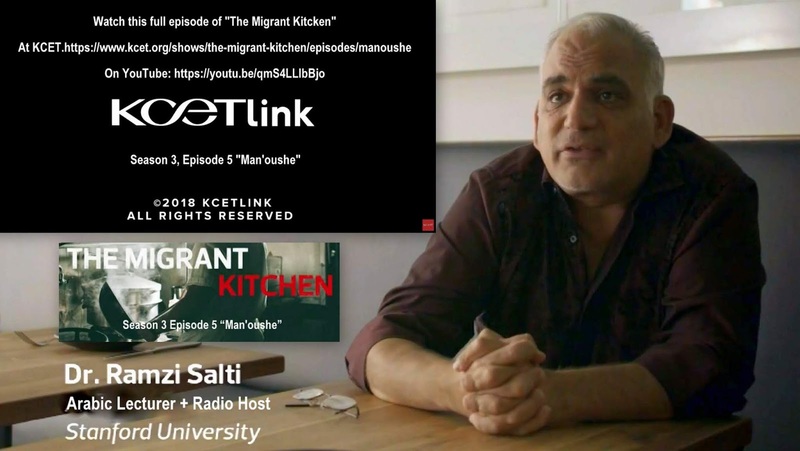 The latest episode of the Emmy Award winning TV series The Migrant Kitchen (aired on December 5, 2018) highlighted the cuisines of two Palestinian women whose culinary skills have long received much critical acclaim in the San Francisco bay area. The episode was titled Man'ouche منقوشة and showcased Chefs Reem Assil and Lamees Dahbour (aka Mama Lamees), both of whom have long attempted to use food to bring their homeland closer to Western tolerance and acceptance. The show also included interviews with Stanford Lecturer/Radio Host Dr. Ramzi Salti + AROC Director Lara Kiswani. 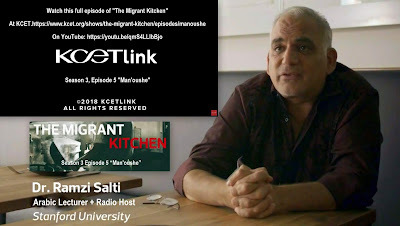 "The Migrant Kitchen" is an Emmy®-winning food series that explores California’s booming food scene through the eyes of a new generation of chefs whose cuisine is inspired by the immigrant experience. Visit the kitchens of those who have transformed the culinary landscape of the state, combining traditional ethnic cuisines and a fusion of new flavors and techniques to make it a food capital of the world. "The Migrant Kitchen" is produced in association with Life & Thyme.